A dining chair with a relaxed look and feel, the Moor Dining Chair from Zuo Modern sparkles in any contemporary or traditional dining room. 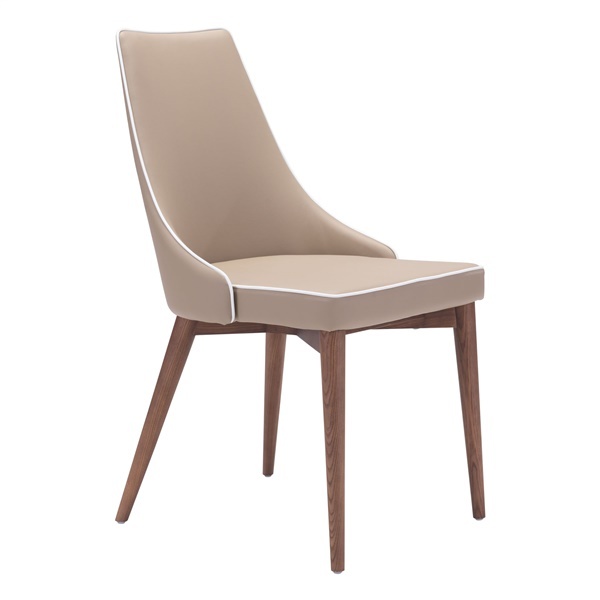 This top-notch dining chair features a leatherette seat and back that deliver outstanding comfort. Furthermore, the chair is available in multiple dazzling colors, making it easy to find a piece that complements your dining room's d�cor consistently. Add a deluxe dining chair that will look great and maintain its appearance for years with the Moor Dining Chair. Offered in numerous eye-catching colors. Exquisite design brings a touch of luxury to any modern or retro dining room. Warm walnut wood base is both stylish and practical. Powder-coated metal finish ensures the chair will dazzle consistently. Leatherette seat and back offer amazing comfort.